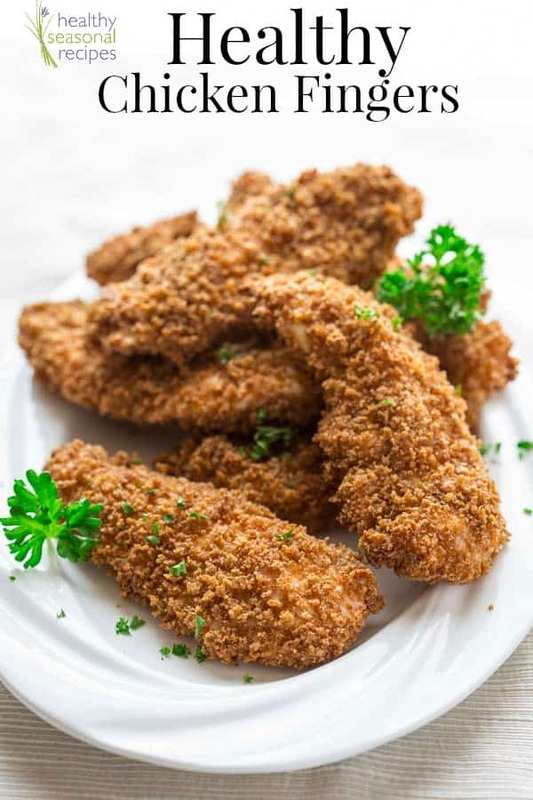 These crispy golden healthy chicken fingers are one of my most popular recipes of all time. The key is the fool-proof oven baked breading. They are kid approved too! 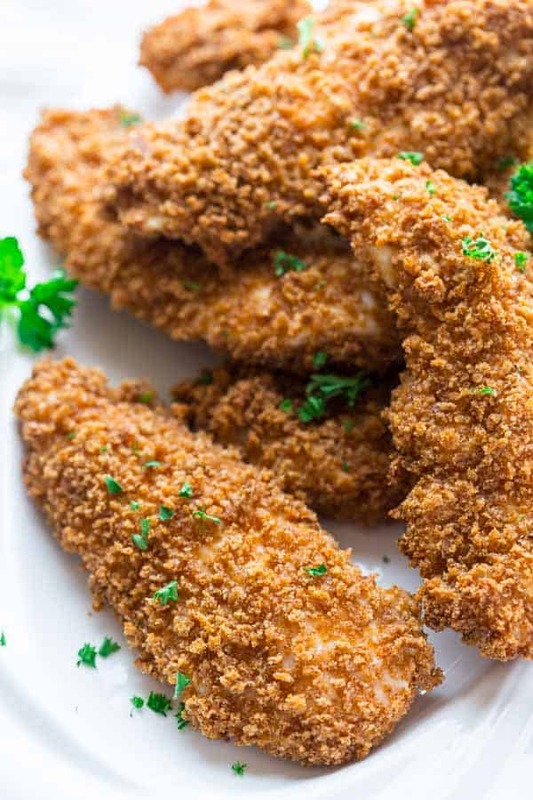 I made these crispy oven-fried chicken fingers from the Healthy Seasonal Recipes archives today and I am so glad that I did! My kids absolutely love them and I was so happy for the chance to update the photos. I’m sure a fly on the wall would be amused watching me go about my day. I must seem like such a crazy whirlwind of semi-functional over-committed chaos. Take buying the chicken for this recipe, for example. This is how it went down. Friday, I stand up from my computer, about 15 minutes later than I should have. The dog still needs a walk, but I have to get to my BodyPump class (and swing by the bank and the grocery on the way). I get into my mud-coated vehicle and get dirt all over my thighs and back of my calfs while loading in my gym bag and getting into the car. When I get home and unpack the groceries I realize that instead of chicken breast I have bought chicken tenders. Which isn’t a big deal, but not really what I had intended to get. I still needed to walk the dog. This is what is known as spreading yourself thin. What was I saying about riverbanks? Here on the blog today, I was actually planning on sharing a recipe for brown rice kale risotto. I’ve been obsessing about it since Christmas when I made one up on the spot to go with our holiday meal. It was so delicious and everyone loved it. So back at home I’ve been trying to recreate it for you. No luck with that. After another disappointing test on Sunday night, I decided to keep working on that one. Stay tuned later this week to find out if I figure out the way to make that one work. Update: It worked! Here’s that risotto recipe! So Monday, dreading having risotto for dinner for another night in a row, I go blazing out of the house for yet another whirlwind trip out the door with a couple stops on the way to BodyPump. (This time I was working on the timing in the core track — still can’t figure that one out…). And I was somehow in the midst of it reminded of these healthy chicken tenders. Thank heaven for these chicken tenders. These healthy chicken tenders have been on the blog for more than five (count them, five!) years now and are a total favorite of mine and many readers. I have heard from friends that these chicken tenders are a regular part of their family’s menu rotation. And I was so relieved today when I thought of them. I knew I could bust them out today and make delicious lemonade out of lemons. 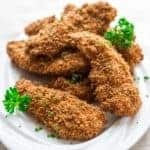 Prep the coatings for the chicken tenders — These healthy chicken fingers are dipped first in a flour mixture, then eggs, and finally the panko breadcrumb seasoning. Before doing anything else, you need to set up stations to dip the chicken tenders into each coating. So first you’ll want to mix the all-purpose flour with some salt in a shallow dish. Then, beat the eggs in a second shallow dish and set that next to the flour. Lastly, stir together the breadcrumbs, paprika, garlic powder and salt in a third shallow dish. Drizzle oil over the breadcrumb mixture and then mix thoroughly with a fork until all of the oil and spice coats the breadcrumbs. 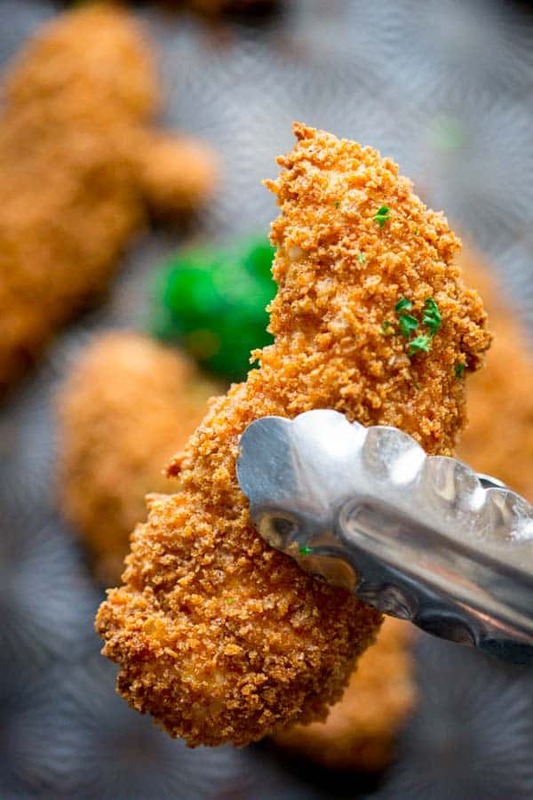 Dredge the chicken tenders in the coatings — My top tip for this step is to use one hand for the dry ingredients and one for the wet ingredients while dredging the tenders. Dip a chicken tender into the flour mixture, turning to coat completely. Then dip it into the eggs, coating completely. Then press the chicken tender into the breadcrumb mixture, turning to coat completely. Continue with the remaining tenders one at a time and then discard any leftover dredging mixtures. 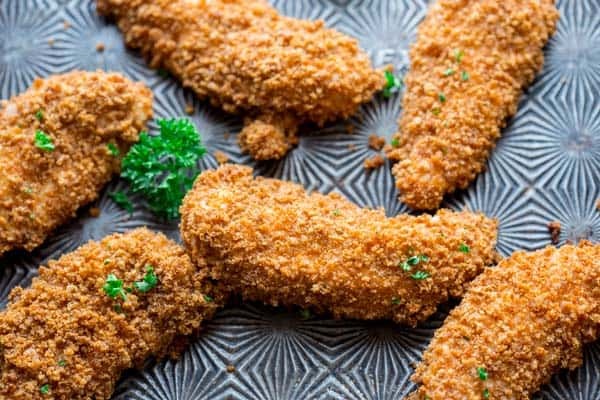 Bake the chicken fingers — Transfer the breaded tenders to the oven and bake until the chicken is cooked through. These oven baked chicken fingers are delicious dipped in ketchup, bbq sauce, or honey mustard. For a side dish, keep things simple and prep something while the chicken tenders are baking. Sauteed swiss chard fits the bill nicely, as do these balsamic green beans, steamed cauliflower with herbs, and garlic mashed broccoli. 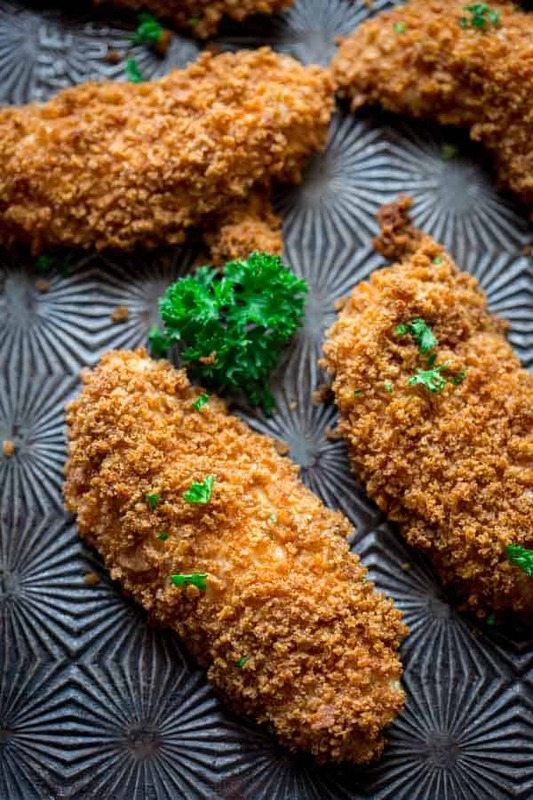 If you don’t mind juggling a few things in the oven at once, you could also pair these healthy chicken tenders with some skinny oven fries or Cajun fries. I’ve been dying to try making no-noodle Cauliflower Mac and Cheese. Have you tried it? Don’t miss the salad feature I did for theKitchn last week. 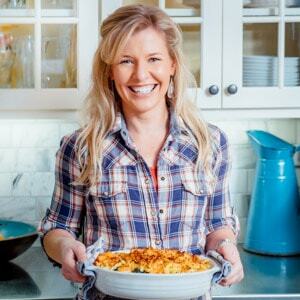 And did you catch my 400-calorie meals in EatingWell Magazine this month? My kids love this 20-minute Cheese Tortellini and Veggies recipe. What would a fly on the wall say about your ordered chaos? What do you do when you realize you’ve brought home the wrong item? Do you have any old favorite recipes that save the day? These heathy chicken tenders are baked in the oven instead of fried. They’re breaded in panko mixed with seasoning and oil, then baked to make a super crispy coating. Plus, they’re kid approved! Preheat oven to 400 degrees F. Coat a large baking sheet with cooking spray or brush lightly with oil. Mix all-purpose flour with 1/4 teaspoon salt in a shallow dish. Beat eggs in a second shallow dish. Set next to the flour. Stir breadcrumbs, paprika, garlic powder and the remaining 1/4 teaspoon salt in a third shallow dish. Drizzle oil over the breadcrumb mixture and then mix thoroughly with a fork until all of the oil and spice coats the breadcrumbs. Set to the side of the egg mixture. Use one hand for dry ingredients and one for wet ingredients while dredging the tenders. Dip a chicken tender in the flour mixture, turning to coat completely. Dip into the eggs, coating completely. Press into the breadcrumb mixture, turning to coat completely. Set on the prepared baking sheet. Continue with the remaining tenders one at a time. Discard any left-over dredging mixtures. 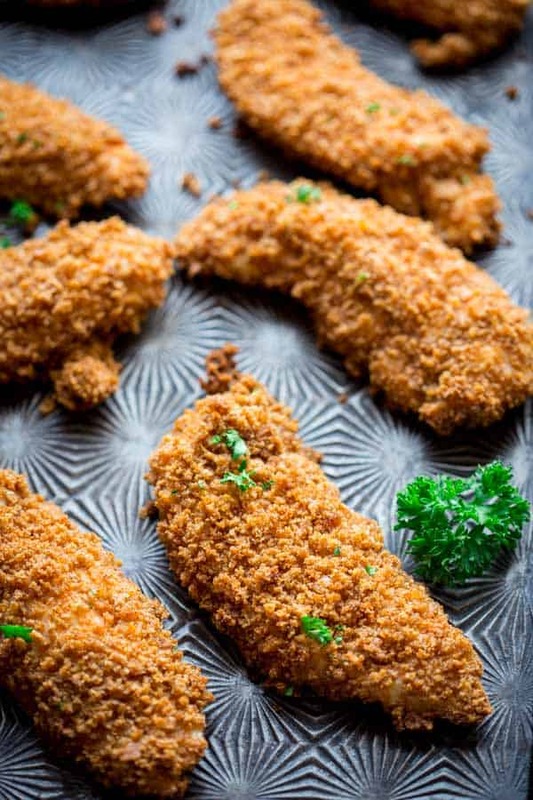 Transfer the baking sheet of breaded tenders into the oven and bake until the chicken is cooked through, 22 to 25 minutes. Ha! You sound like every American Mom out there—spread WAY too thin! But these chicken fingers–yum!! Love panko as breading. Thank you Kristen. I know I am not alone. 🙂 Thanks for visiting today. Have a great one. These chicken fingers sound so good! I definitely prefer baked to fried, I will need to try these! The panko makes them ultra crunchy. Hope you enjoy them Maye. These will bring you back for sure! As I was making them yesterday I was thinking I should try turning these into a gf version too. So many readers are GF, so it may happen soon! Crushed corn flakes make excellent gf chicken fingers!! I love this Katie! It’s okay- I’m my own organized chaos mess too! But, it’s a beautiful mess and I love it! I most definitely do not return to the store, I would do the same thing! Whip up a classic I know I can recreate or invent something knew with the item I picked up. No one’s got time for another trip to the store- right?! Awww, thanks Elizabeth. And so true about not having the time to go back to the store. Thank you for dropping by today. Have a good one. I’ve tried making my own chicken fingers MANY times only to get the big “no thank you” from my uber-picky kids. I have not admittedly tried this fancy 2-step technique and am eager to give it a go. Wish me luck! I was just thinking of you today Alexis. How are you friend? I hope they give you the thumbs up on these. i had to run for my workout class instead of walking my dog…i feel you girl. im always looking for different chicken recipe and this one looks wonderful. adding it to my mean plan. It is a constant battle in our family. I always feel guilty for not giving her enough exercise. Now it is sub zero and blowing snow! Ha ha. #excuses! 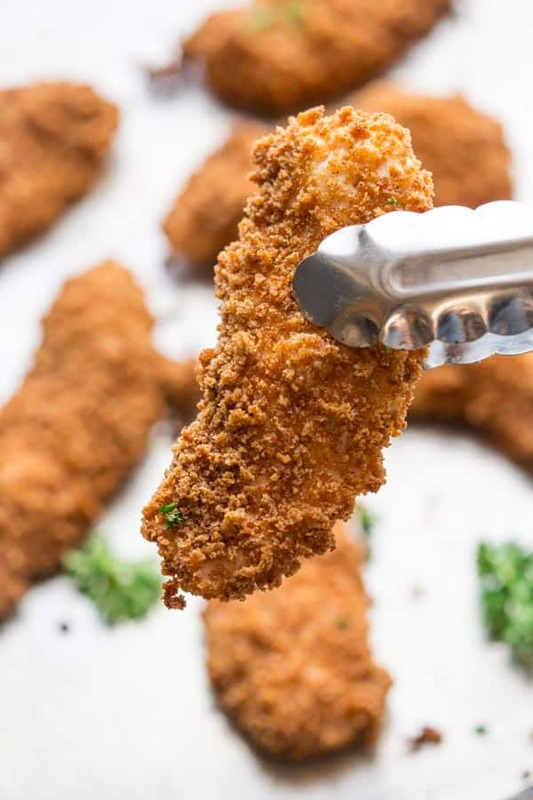 These tenders look phenomenal- I know my daughter (along with my husband and I) would eat ’em up! I’m exhausted just reading about your day-whoa! Yeah, it can get a little crazy around here. But I totally bring it on myself. I am always trying to pack a suitcase worth of stuff into a tiny purse! Ha ha! Dinner is often like chopped around here. If I’m not testing a recipe, I often don’t even know what i am making until I am half way through. Hope you like them Lauren. Have a great day! Wow! These look so delicious! I love your story too…I work full-time and often feel like that! It feels good to commiserate at least. Ha ha. Thanks for coming by Cynthia. Happy cooking! I love how simple this recipe is Katie! And these would make the perfect kid-friendly dinner with your oven fries! It really is a breeze! Thank goodness! Glad you came by Katie. Have a great day! My kids love chicken tenders. We can always count on my 8 year old to order them on the rare occasion we go out to dinner. I love how crispy panko is. Mine love to order them when we go out too. I always try to talk them out of it since I know that they came from a bag in the freezer and then were cooked in a fryalator. Plus how unadventurous! Ha ha. Happily though they love these healthier ones too so they can eat all they want at home. This sounds a little too similar to my day, haha! Running around like CRAZY trying to get something done, but there are 9834785 other tiny things to do before that something. Thank goodness for recipes like this! It looks delicious Katie!! Totally! It can be so hard to resist. I see the pile of laundry and then I think I should start that. I am chronically overstuffing my time. Arg. You bet Rachel. Have a great day! I bought close to five pounds of chicken tenders with this recipe in mind (it was on sale… and I didn’t check the weight, assuming each package was a pound–oops). This is the first time I’ve made breaded meat (I did breaded zucchini fries once, ages ago), and I had the hardest time keeping it straight which hand was for wet stuff and which was for dry. lol I kept having to wash my hands because I mixed it up… Anyway, this was more or less a bust for me. The chicken was really watery, so I kept having to put it back in the oven, flipping it so it wouldn’t burn too much. The breading was bland to the point of when I ran out of bread crumbs with about a pound of tenders to go, I seasoned the next batch with a teaspoon of garlic salt and two teaspoons of Italian seasonings (the only seasoning combination I know works… I’m a total derp when it comes to the kitchen). Still didn’t seem to help much. My boyfriend (who I made these for, since he has a lot of digestive issues and this looked safe for him) won’t eat them, and I have to smother them in some sort of sauce to make them taste good (I found an easy mix of dijon mustard and barbecue sauce is pretty tasty). I don’t know what went wrong. It makes me sad. I was hoping I’d be able to load the freezer up with easy, healthy, reheatable meal stuff… Question, though. What is sweet paprika? I couldn’t find a straightforward answer through searches, and I couldn’t find it anywhere. I did find Belgian(?) paprika at one place, but I don’t know if that’s what I needed. I ended up just using normal paprika (before switching seasonings). Hey Sherwood. First of all, good for you that you are making healthy food from scratch for your freezer! That is awesome and I hope I can help you trouble shoot this recipe. I am sure we’ll be able to figure out what went wrong. I find that when scaling certain recipes up they don’t always work out as planned. I’m assuming you did a 6x batch of the breading right? There is just enough to coat a pound of chicken as is, and I had to be careful to not go hog wild pressing a ton on. You mentioned that you washed your hands so if some of the breading it got washed off you’d likely run out. Then I’d recommend just really not overcrowding the pan. For a 6x batch you should bake the batches separately. Otherwise the chicken will weep out moisture which will cause the problems you mentioned. I’d recommend trying it one more time (if you are willing) and just do it with one pound of chicken. Try to not over-bread each tender and see how that works for you. I love the idea of making a dipping sauce with bbq sauce and Dijon. That would be yummy! Oh and sweet paprika is just regular paprika. Opposed to HOT paprika or smoked paprika. Sounds like you used the right stuff. Phew. That was a lot. Let me know if you have any other questions and Happy Cooking! Well, I started off by just doubling everything. There was still some flour and egg left over in the end, but I did have to make a third batch of the bread crumbs (using different seasonings). I don’t think I overcrowded the pans. At no point did pieces touch. I think there was at least an inch between everything, and I definitely did multiple batches. One pan of chicken out of the oven, another in. I think I’ve read that at least with baking you shouldn’t put multiple pans of stuff in simultaneously because it messes with the heat, so I applied that to this just to be safe. I think I will try these again (with just the pound of tenders) at some point, and I’ll let you know how that goes whenever that happens. Happy to hear I used the right paprika! It definitely lends a nice color to the finished product. You can tell which tenders have it and which don’t! Good to know. Thanks for sticking with it, and let me know if it is a better turn out this time. It seems so crispy, I can’t just wait anymore, gonna try this tonight! I just made these for my daughter and her family tonight for dinner. Everyone enjoyed them – especially my granddaughter and picky son-in-law! These are a keeper. I made a double batch so she could have the extras in the freezer for quick meals. I added a little onion powder to the panko breadcrumb mix and turned them over halfway through the bake. That’s wonderful to hear Betsy. I really appreciate your coming back by to say how things went. Have a wonderful day. How do you get off calling your Chicken Tenders HEALTHY??? 584 mg sodium per 4oz serving is certainly NOT healthy! That’s more than 1/4 of suggested maximum daily value (unless, like me, you have to stick to 1,500 mg of sodium maximum daily due to hypertension in which case it’s more than 1/3). Hi Jim, Thanks so much for coming by and for your reminder about sodium in our diets. I am sorry to hear you’re struggling with hypertension. That must be a challenge! I am glad to hear your doctor has recommended you watch your sodium intake. If you would like to decrease the sodium in this recipe you can simply omit the added salt. Doing so will decrease the sodium by about 290 mg per serving. If your palate is used to a lower sodium diet, this should not adversely effect the recipe. As far as my “getting Off” on choosing titles for my posts, I wouldn’t exactly put it that way but I am so glad to think that my readers perceive me in doing so. As far as nutrition standards, I loosely follow those set by EatingWell (I am a contributing editor and former test kitchen developer.) Their RDs recommend keeping the sodium in a “combination meal” at less than 750 mg and entrees at 480 mg. Because this is somewhere in between (both meat and starch) I did go over the sodium limit for an entree but fell short of that for a combo meal. When choosing your vegetable side dish, I would recommend keeping it below the 750 total mark for an average reader. Here’s more about that. http://www.eatingwell.com/article/290342/our-food-nutrition-philosophy/#Nut Hope this helps Jim. Happy Cooking! 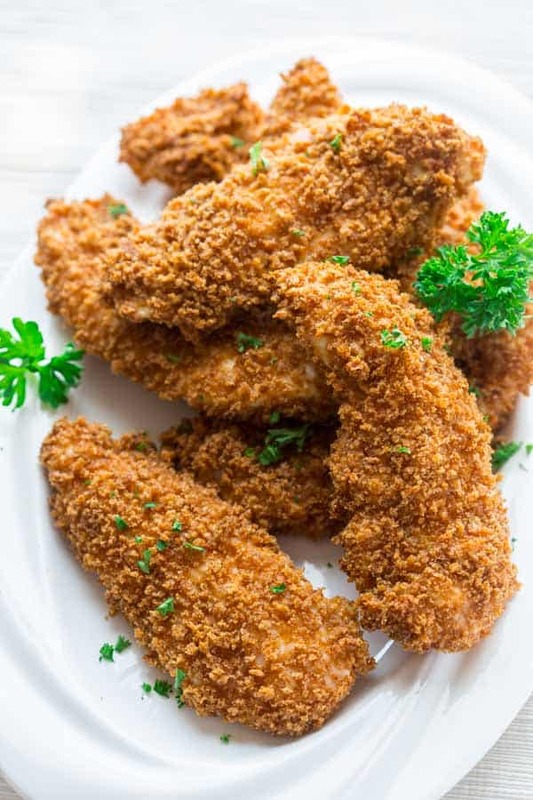 I make chicken fingers quite a bit, but have been searching for a healthier recipe. Yours is perfect! I hope you enjoy this recipe Liz. These are the best – love getting to make things like this at home instead of buying the pre-made ones. Thanks Erin. Making them from scratch is so much better (and less expensive!) Thank you for reviewing, I really appreciate that. These look delicious, and the use of spices with the panko is perfect! Love that crispy coating perfection from the oven! I can see why these would be a dinner repeat! 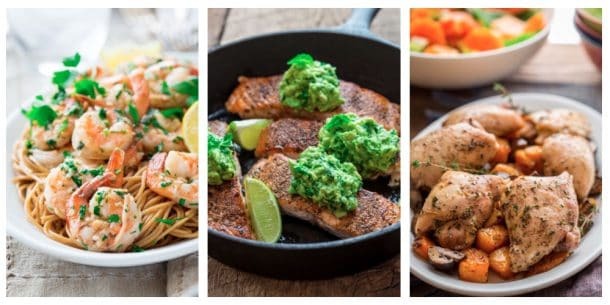 What a yummy, healthier recipe! I love the crispy coating! Love making my own chicken tenders and nuggets. They always taste so much better than those you can get in the frozen section at the grocery store! My kids will absolutely LOVE THESE! Made this twice and love it. Replaced paprika with cayenne for a little spice – my whole family loved it both times! The best chicken tenders I have eaten in a long time. They were crunchy, moist and tasty!